Armistice Day is set aside to remember those who have died in conflicts across the world. It is a chance for us to appreciate those that gave their lives for our freedom, whether they had the choice to fight or not. 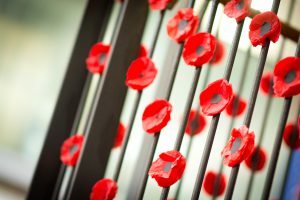 Armistice Day is so called because the end of the First World War was on the 11th November 1918. This is therefore a special year, as it is 100 years since the end of the First World War. The First World War was fought over a period of 4 years and nearly 17 million people died, which is over 25 times the amount of people that live in Leicestershire today. The symbol of remembrance, the poppy, is also taken from the First World War because it was the first thing to grow on the battlefields when fighting had finished. 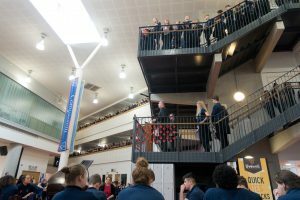 When pupils of the school met for the 2014 Armistice Day, we remembered that it was 100 years since the start of World War I. 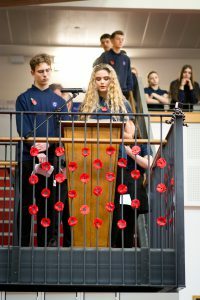 Current Year 11 pupils were in Year 7 and helped to make the poppies on display and those that will fall from the balcony. 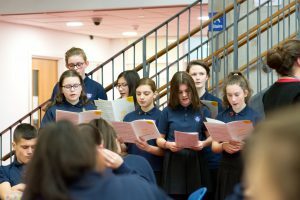 From the start of Year 7 until Year 11 is the same amount of time over which World War One took place. Had we been alive during that period of time then we may well have been fighting ourselves and definitely would have suffered from the loss of our children or boyfriends or husbands or fathers or brothers or friends. Private 6322 John Condon was one of thousands of lads who lied about their age to fight for their country, he is recorded as the youngest soldier to die in the war. In the corner of a cemetery in Belgium is a grave that stands out from the 6,544 other headstones for British soldiers who died in this area during the First World War. It stands out because it is surrounded by small wooden crosses decorated by poppies. The crosses have been placed by British schoolchildren of the same age as the boy buried here a century ago – Private 6322 John Condon, aged 14. Pte Condon, was one of thousands of lads who lied about his age to fight for his country, is recorded as the youngest soldier to die in the war. He was killed in the Second Battle of Ypres, when the Germans used poisonous chlorine gas for the first time. The trench he lay slumped in to escape from the artillery and grenade onslaught of the advancing enemy was drowned by a cloud of the yellow gas, tearing at the youngster’s lungs and scorching his eyes. Today his grave is the most visited on the Western Front. It is believed that only the Tomb of the Unknown Soldier in Westminster Abbey receives more visitors. The boy soldier had claimed he was 18 when he enlisted in his home town, two years before. He was really only 12 years old. At the outbreak of war, the German army was three million men stronger than the British Army. So a frantic campaign for volunteers was launched and among those who joined up were 250,000 lads under the age of 19, the legal limit for armed service overseas. Such was the demand that recruiting sergeants turned a blind eye to teenagers who were obviously far too young to fight. And when the recruiting sergeants were being paid two shillings and sixpence for every new recruit, they weren’t going to turn many away. As excitement swept through the country, boys would join the back of town parades and only later tell their parents they had enlisted. There are scores of military cemeteries dotting the countryside across the Flanders region. Nearly 60,000 British troops died in the Second Battle of Ypres over a two-month period. Six months after arriving in France with the British Expeditionary Force, John met his end. His parents had believed he was still at barracks until they received a letter from the War Office informing them of their young son’s tragic death. A few miles away in Essex Farm Cemetery on the edge of a busy main road in Ypres, is the resting place of 15-year-old Valentine Strudwick. Rifleman Strudwick, from Dorking, died on January 14, 1916, and was recognised early on as one of the youngest casualties. He had been treated in hospital for three months suffering from the effects of gas and shellshock, before returning to the front line, but died a week later, shortly before his 16th birthday. 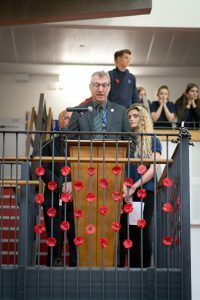 Had they been Brockington pupils during the First World War, John would have been in Year 7 when he signed up and in Year 9 when he was killed. Valentine would have been in Year 10 when he died. 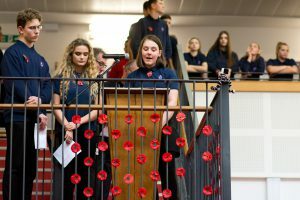 I hope their stories help us all to think about how we would have felt if we had been in the trenches and about how awful war is and how important it is that ourselves as individuals and countries do not choose to solve problems by fighting. 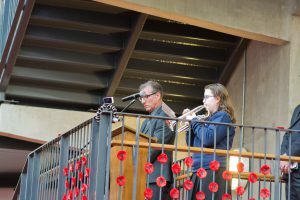 Mr Southall referred in his Principal’s address to the Tomb of the Unknown Soldier. On one of the Armistice Days shortly after the end of the First World War, the body of an unknown British soldier was buried in Westminster Abbey – the place where Kings and Queens are laid to rest. His grave commemorates those who, like 64 men from this parish of Enderby, left these shores sometime between 1914-1918 and never came back. “Beneath this stone rests the body of a British warrior unknown by name or rank, brought from France to lie among the most illustrious of the land and buried here on Armistice Day 11 November 1920, in the presence of His Majesty King George V, his ministers of state, the chiefs of his forces and a vast concourse of the nation. Thus are commemorated the many multitudes who during the Great War of 1914-1919 gave the most that man can give: life itself. It’s right, today and this weekend, that we remember and honour and are thankful for those who gave their lives in that cause. We will remember them. Around the tomb of the Unknown Soldier there are four Bible texts, now almost hidden by the wreaths of poppies. That we are known individually by Him. That we can have life after death because of what God has done. But it’s the fourth and final Bible text behind the poppies that speaks perhaps most powerfully of all and is found on many a war memorial up and down the land. 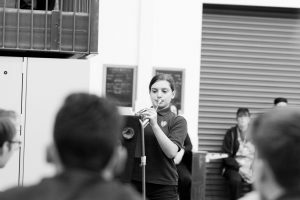 It comes from the Gospel of John – the same book of the Bible our school motto comes from – “learning to live life to the full” – in this case from chapter 15. Soldiers serving in the First World War might have read it in these copies of John’s gospel they were all given when they signed up to fight. 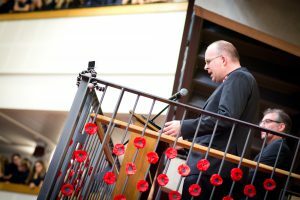 Today, as we rightly remember the many who gave their lives as a sacrifice for our freedom and way of life, we ought also to pause and remember the One – the Lord and Saviour Jesus Christ – who gave His life not just so that we might know peace in our time between nations and among ourselves, but peace with God in all eternity. 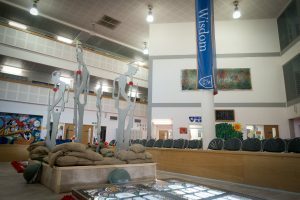 Our hearts, says Jesus, are no purer than those who wage war – we can be at war among ourselves, even with ourselves in our hearts – but Jesus came to live a perfect life and then lay it down as a perfect sacrifice so that by trusting in Him we might know peace with God, peace with one another and peace within. And one day, in heaven, the end of all war.